I couldn't wait to get out of Concepción, the last two days had been tough. 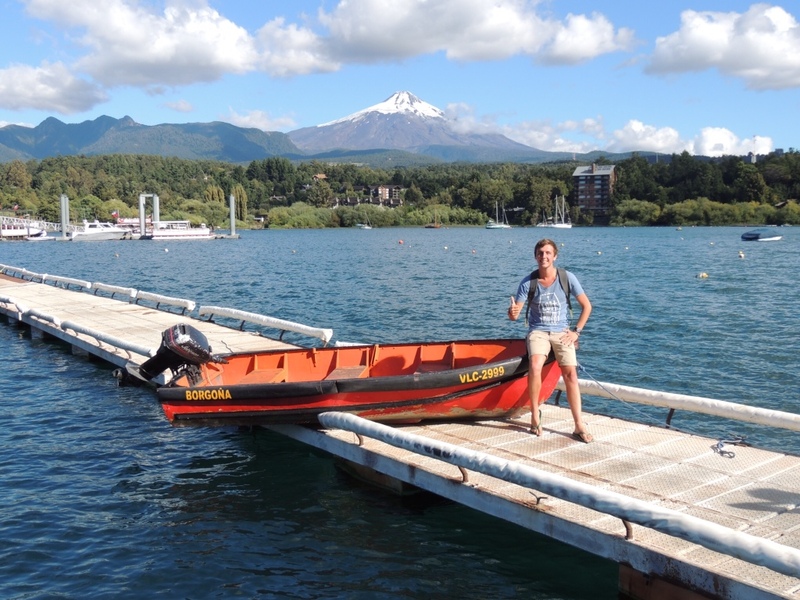 I was finding it difficult hitching my way down to Pucon, there were few other people around and my hostel had easily been the worst so far. I booked a midnight bus to Pucon and spent my last few hours using the hostel wifi until they finally kicked me out at 9:30pm. I shouldered my pack and walked through the dark streets towards the bus terminal. I noticed that it was the first time I could see my breath in the cold night air, and reflected on the beautiful weather of Santiago. Things were definitely going to get colder down south. Much colder. I settled in at the terminal for the last couple of hours, gleefully realising that I could take advantage of the free wifi. The trip south takes about 6 hours, hence my reasoning for taking the overnight bus. Luckily I had two seats to myself, so I sorted out my daypack and got comfortable. Before the bus departed I briefly engaged in a unnerving staring contest with a Chilean baby, who appeared to have an infinite supply of blankets at its disposal. We set off, and I let the constant mechanical sounds and motion of the double decker bus rock me into a deep sleep. About 5 hours later, I awoke as the bus ground to a halt and looked at my watch, 5:30am. I peered out into the unfamiliar streets and a darkened bus terminal, surely we hadn't arrived already. Confused passengers got off the bus, mumbling in Spanish and gesturing towards the closed terminal, all hopes of an early morning coffee had vanished. 'Pucon? ', I enquired to the conductor, 'No, arriba.' He explained. Thankful for the extra hours rest, I climbed back onto the bus and made myself comfortable once more. 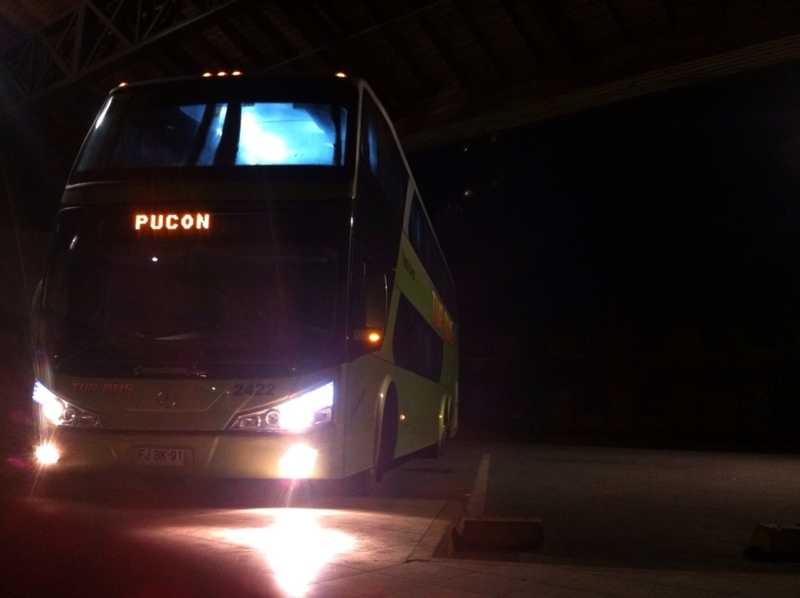 It was still dark as we rolled into Pucon, and we were greeted with yet another closed bus terminal. The only signs of life were three street dogs, who seemed to feel it was their duty to guard the terminal by night. Upon our arrival they burst into life, barking wildly as the bus came to a stop. I decided to wait for first light before venturing into Pucon. Exhausted, I acquired a map from a nearby hotel and made the short walk across town to my hostel, where I was greeted with a locked gate and more darkened windows. Being the patient person that I am, I found a way in via another gate and rang the doorbell twice. After five minutes the door opened and the woman, speaking rapid and indecipherable Spanish, gestured for me to come inside. I explained that I didn't have a reservation and gave her my nicest smile as I asked whether they had a room. Once again, she motioned for me to follow and took me straight to an eight share dorm. Whispering, she pointed to an empty bed. I couldn't believe my luck, usually arriving so early at a hostal means you are doomed to spend the morning and part of the afternoon sleeping uncomfortably in the common area waiting for check in. Here, that was obviously not the case. I placed my hands together in thanks, dropped my bags and crashed until after midday. I woke up in the afternoon to the sounds of people in the kitchen and common area. I changed my clothes and headed out, desperate for some sane human contact after my time heading south from Chillán. 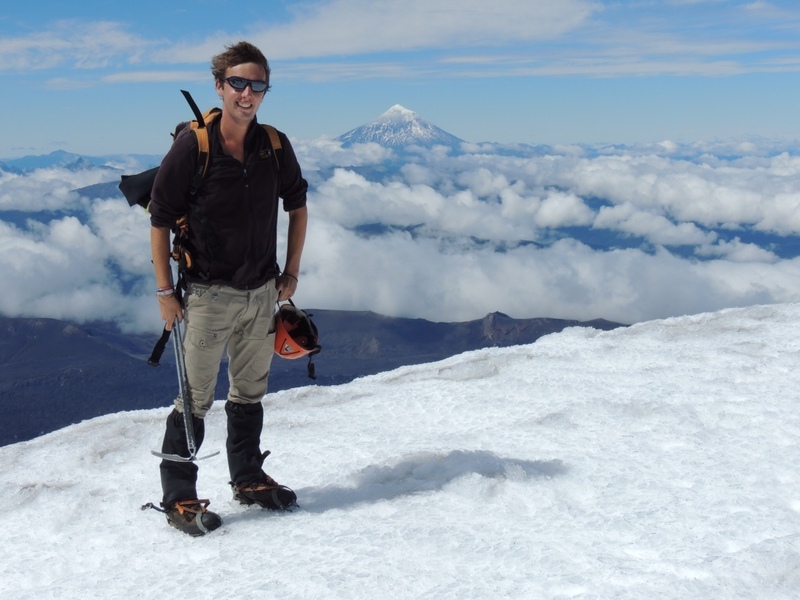 I quickly met two English guys who were heading to Santiago that night, and chatted to them about their time in Pucon. 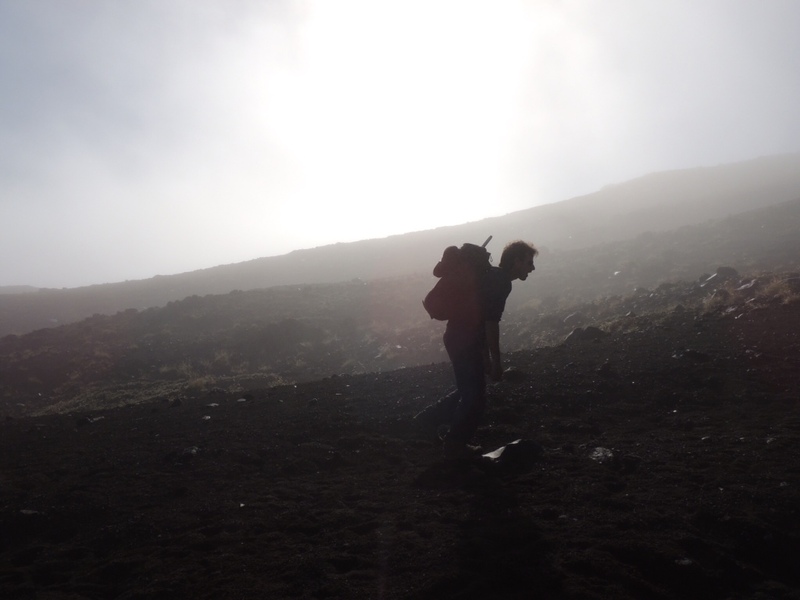 They recommended doing the volcano tour with the hostel, and I quickly added it to my plans. As the day rolled on I did some more planning, meeting plenty of others who were in Pucon to trek, explore the national parks and hike the volcano. Excited to have a great group of people together again, I organised to hike the volcano on Sunday with a middle-aged American nomad, Rus, and a Swiss trekker called Eddie, who was on his way north after doing some awesome trekking down South. A crazy Swiss girl, Nicole, and Johanna from France joined us on Saturday and we spent the afternoon hanging out and making the obvious jokes about each other's home countries. Johanna made the point that it was a Saturday night, surely we should have a few drinks to celebrate our new friendships? 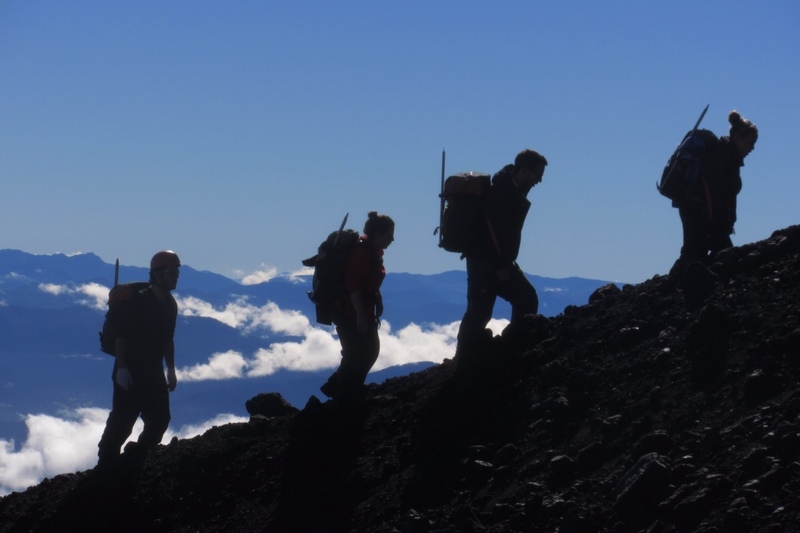 So, thanks to Johanna and a fair amount of celebrating on Saturday evening, I awoke on Sunday morning ready for the 6-hour hike to the icy summit of Volcán Villarica, boasting one hour of sleep the night before and a slightly sore head. We weren't the only ones who had taken advantage of Saturday evening, a nine-strong group of Israelis were also in fine form, having celebrated their friend's birthday the night before. They had less sleep than I did, and even had a bottle of champagne packed for the volcano summit. 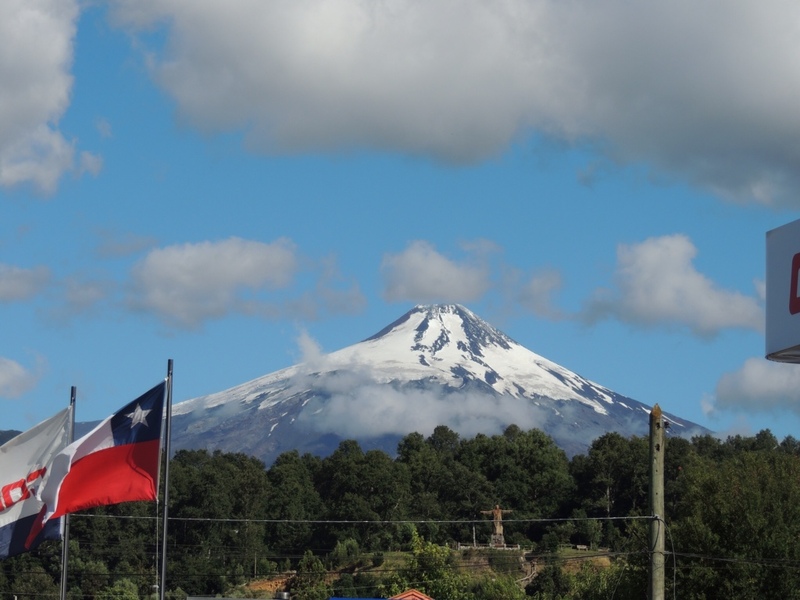 Volcán Villarica stands at 2847m above the towns of Pucon and Villarica, and is a truly majestic sight to behold from the city streets among the mountains that surround the town. The volcano is currently in a dormant phase, but was extremely active just last year, when lava could be seen spitting from the crater. 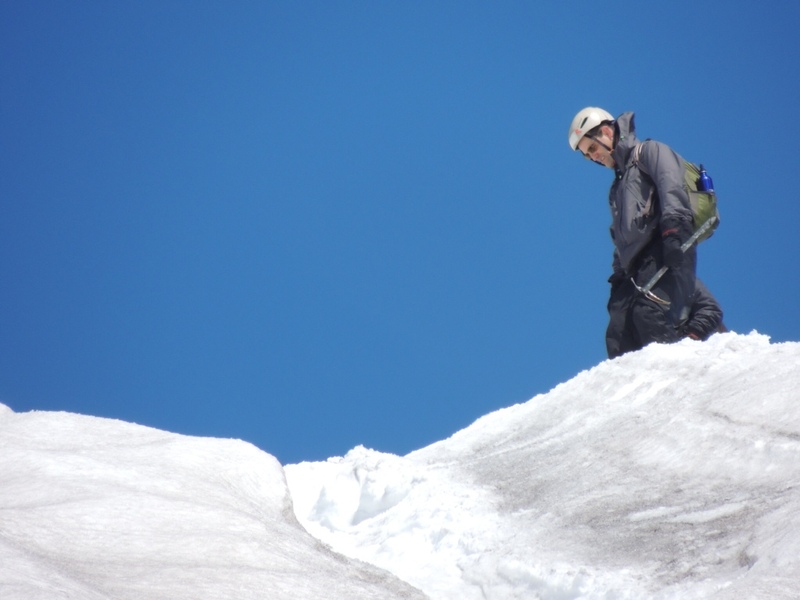 The ascent is a challenging 6 1/2 hour climb, initially on rocks and then snow and ice. 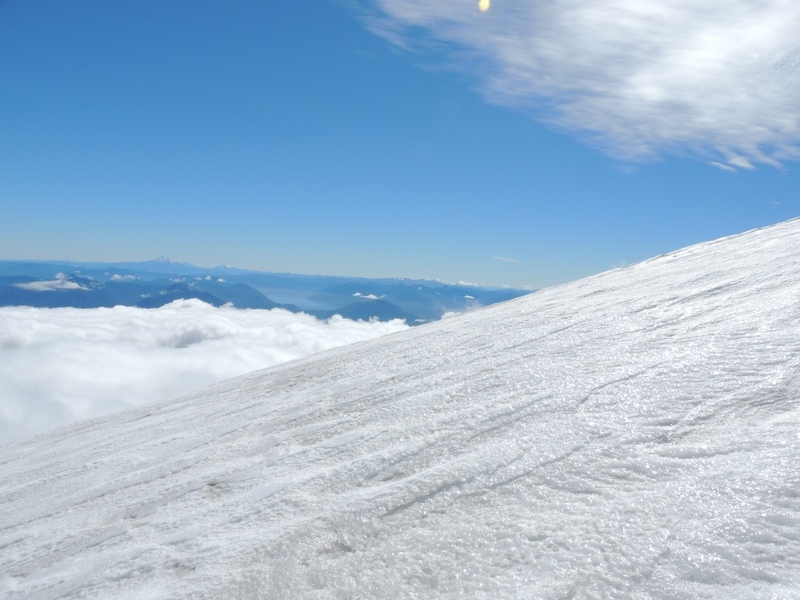 On a clear day, visitors to the summit are offered a 360 degree view of the Lake District, stretching to Lago Villarica, las Lagunas De Huerquehue and the national park, and east to Volcans Quetrupillán and Lanin on the Argentinian border. The hike is a dangerous one, on which several tourists have died trying to complete. 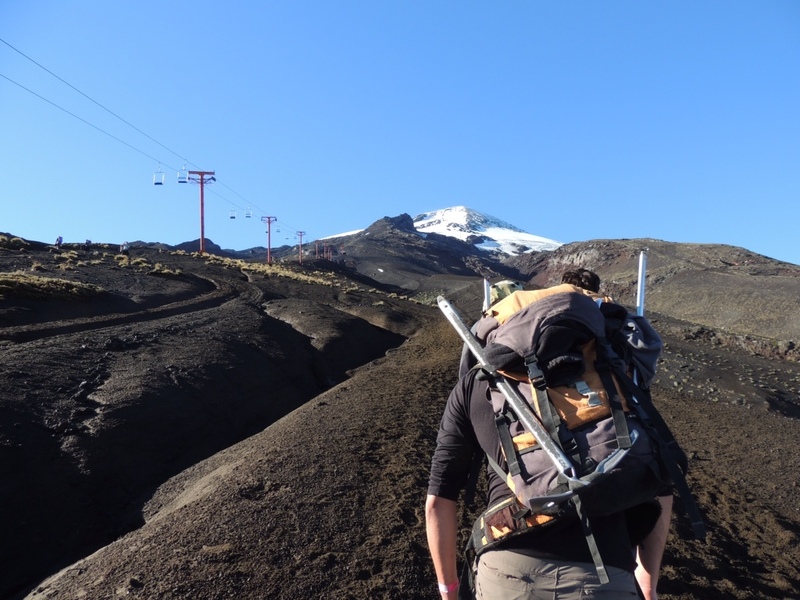 High winds and sometimes treacherous conditions mean that this hike is now closed to the public and people must climb the volcano with a registered tour provider or hold a mountaineering license in their own country. I was really glad to be doing it with a hangover. 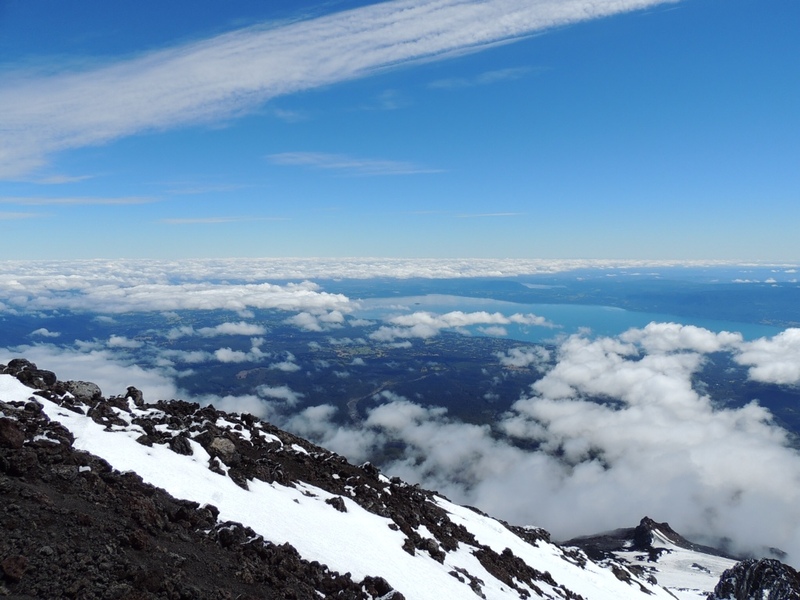 The bus trip to the base of the volcano is a quick 30 minute ride from Pucon. Once there, we adjusted our gear and admired the beautiful weather that Sunday had given us. There was barely a cloud in the sky and our guide explained that this was the best weather they had seen since the end of high season, two weeks ago. 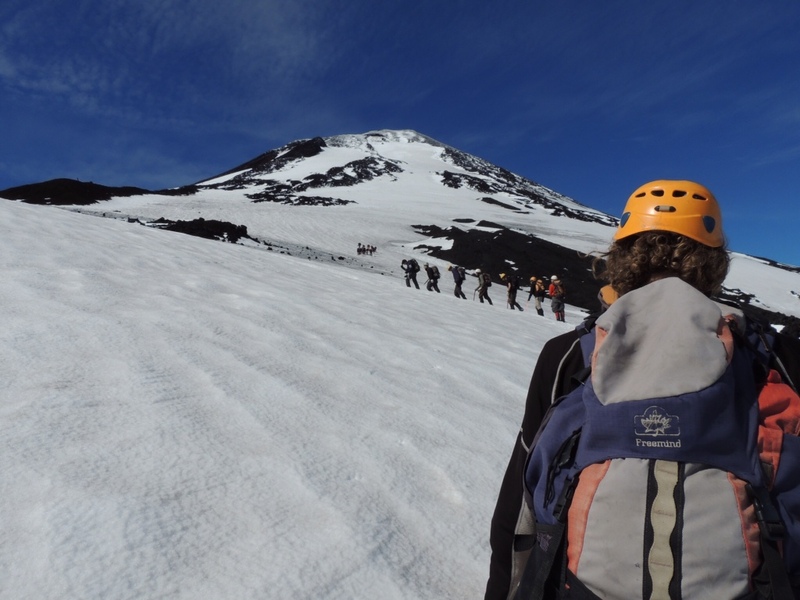 Our group began the steady, steep climb over rocks towards the base of the snow cap. I soon realised that this wasn't going to be a walk in the park, and tried to keep up the pace as I trudged diagonally up the mountainside, one foot in front of the other. After about 3 hours of ascending, we were welcomed by a small base camp and the ski lift station. After some cookies and some water, we hurriedly attached our crampons to our hiking boots to brave the icy part of the climb. As the mountainside transformed, so did the view beneath us. Through practically zero cloud, one could take in the two beautiful lakes of the region, their towns and adjoining parks. The sensation of hiking up through layers of cloud cover is simply incredible and gives you the adrenalin and motivation required to reach the top, even when things get really tough. At more than one point I found my legs screaming for a rest as we cut back and forth across the slope through ever deepening snow. My toes became numb, followed quickly by my fingers as my pack seemed to become heavier and heavier, but every glance up, down or across the mountainside made every step worthwhile. 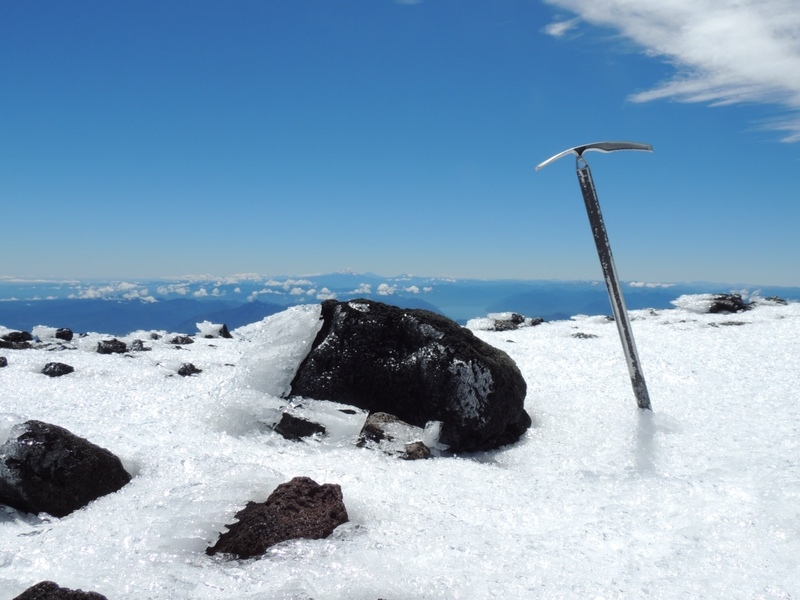 After the third hour pushing up the mountainside through ice and snow, I leaned on my ice axe and glanced to the summit. Clouds of sulphurous volcanic smoke poured from the crater and drifted down into our eyes and mouths, stinging and choking our throats. Twenty minutes later we finally reached level ground, peppered with rocks and glistening icicles, forced to form sideways by the strong winds that the summit is exposed to. 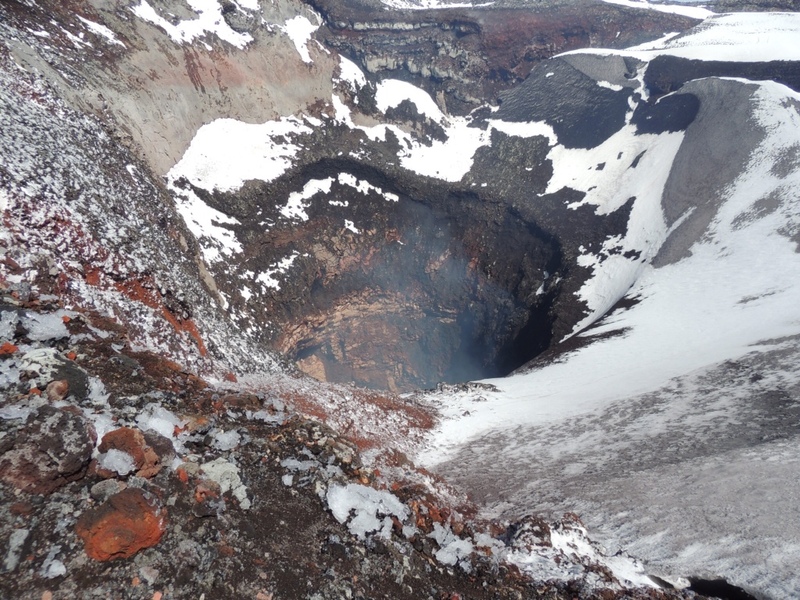 We paused to take photos and peer into the deep crater, before seeking shelter from the wind to enjoy a heard earned lunch of cookies, bread, ham and cheese. 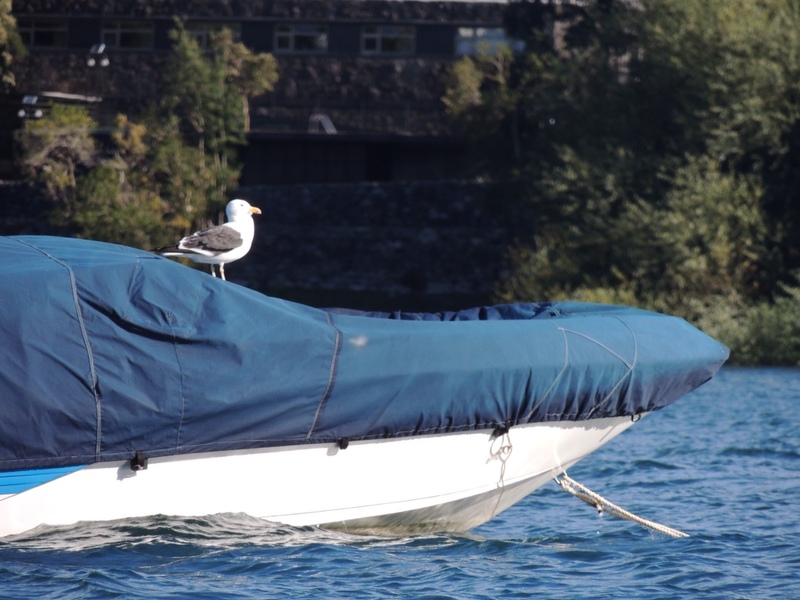 Afterwards, we stepped out once more to enjoy the breathtaking views of southern Chile's Lake District. Although incredibly beautiful, the cold soon began to wear on our bodies. We adjusted our gear for the route down the mountain (crampons off, waterproofs on!) and grouped together for our return trip. Ascending the mountain had taken a little over 6 hours, our guide explained, descending would take just 2! Why? The side of the mountain has steep grooves, worn in by other hikers who have slid down from the summit either on their waterproof pants, or by using small plastic paddles. We were briefed on how to descend safely, using our feet as a front bumper bar for any large surprise rocks and our ice picks as braking mechanisms. I'd like to say I achieved the descent gracefully, but I would be lying. Several times I lost control and flipped sideways or upside down, often resulting in a face and nose packed full of bitter, sulphurous snow. It was great fun nonetheless, watching myself and others slide, tumble and crash into one another in spectacular fashion. With weary legs and soaked clothing, we returned to the hostal for food and hot showers. 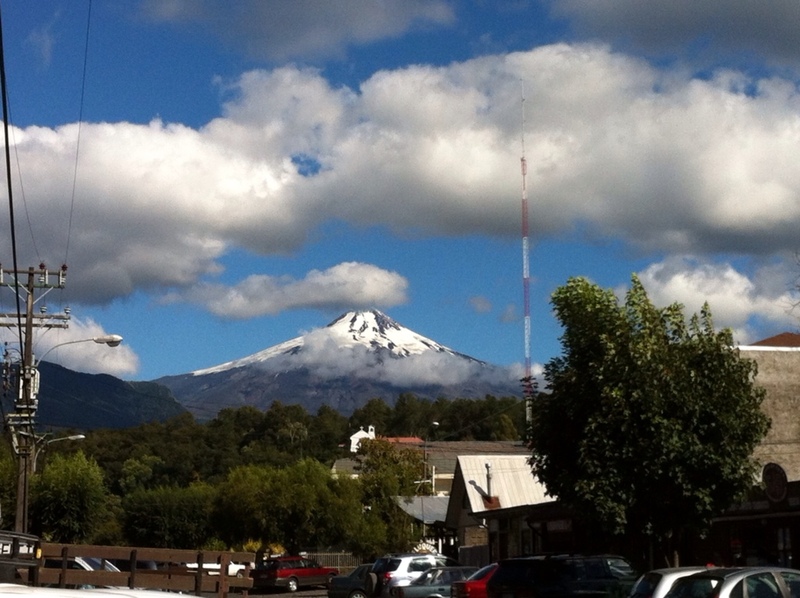 Seeing the volcano from the streets of Pucon for the rest of the week has fulfilled me with a sense of satisfaction, knowing that I made the challenging climb to the summit. 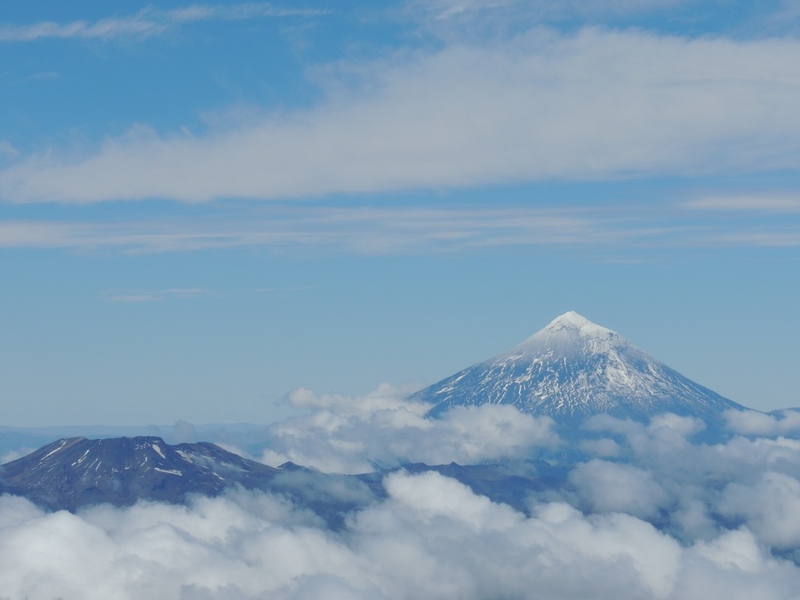 See below to enjoy some of the stunning images I was able to capture from the volcano and a few pictures around the town of Pucon. Stay tuned to the blog and Facebook page for some updates on my trekking through Parque Nacional Huerquehue. Make sure you ask around about the volcano tour if you want to do it. Lots of different companies do it and they vary in price. 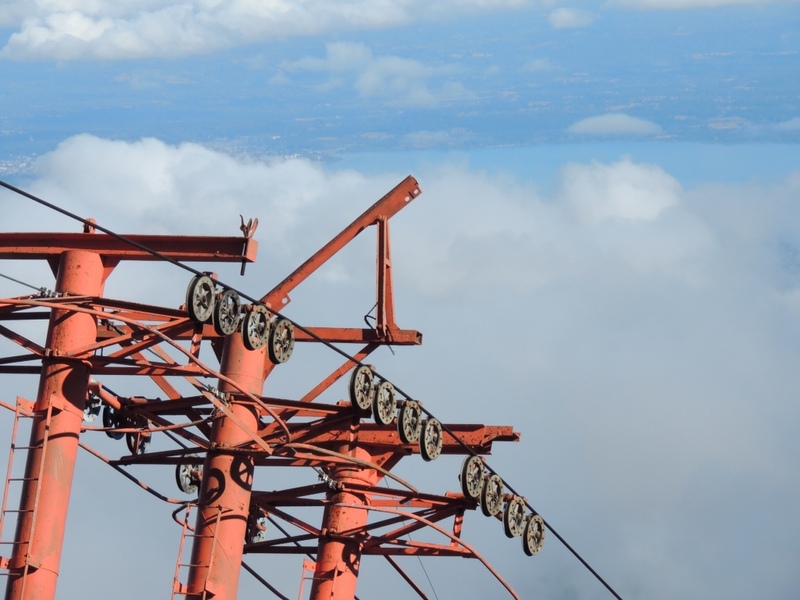 If you have time, wait until you have a day with good weather to ascend. It makes a huge difference. 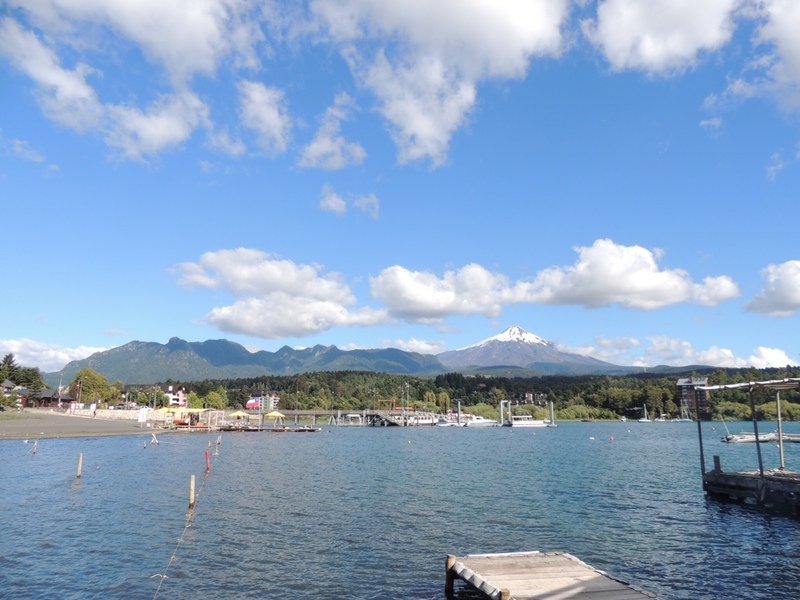 Pucon is a hub for all sorts of activities. 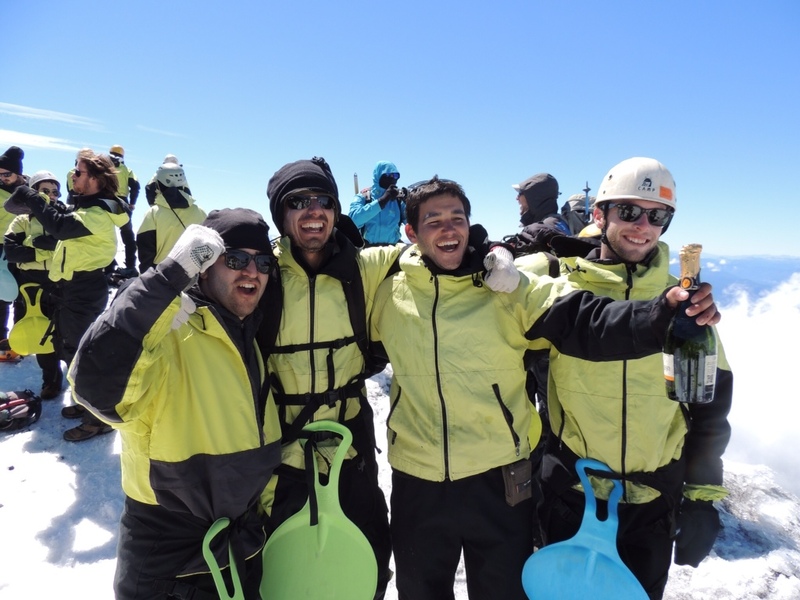 It offers all sorts of adventure tours which can be quite expensive. 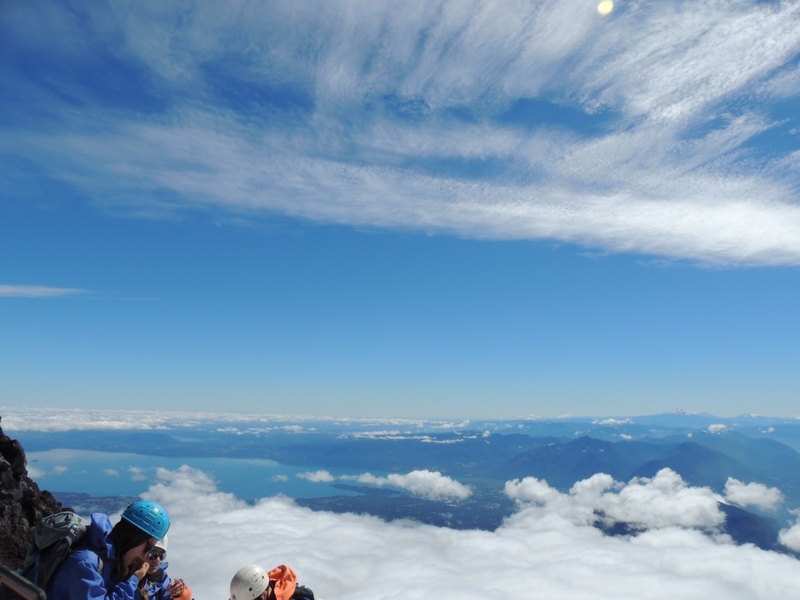 A cheaper option is the easy and great trekking in nearby Villarica and Huerquehue. I stayed at Backpackers Hostal on Palguin and I totally recommend it. The staff are incredibly kind and helpful and the hostal has great facilities. It is as cheap as $7000CHP ($14.50AUD) per night for a two share dorm in the off season! 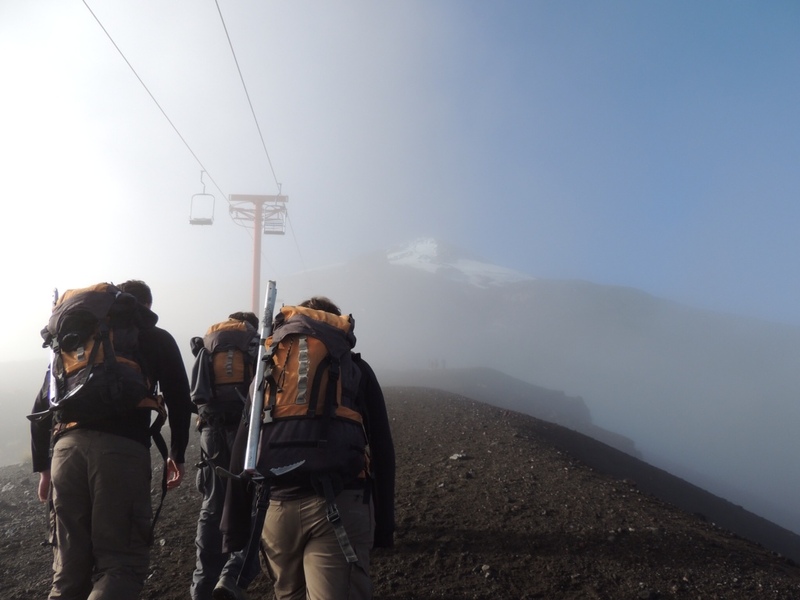 ← Chillan, Las Trancas and Volcanic Termas.